We got our hands on the long-awaited new entry in Square Enix's legendary series. Here are our first impressions. I know, I know, itsbeen84years.gif. But it happened! People outside Square Enix have actually played the third mainline entry in the long, long-running Kingdom Hearts series. And I’m one of them! Kingdom Hearts has touched countless lives across numerous games since the first title in 2002 — KH3 is only the series’ third mainline title — impressive for a collaboration that stemmed from a casual elevator chat between executives (Square Enix’s Shinji Hashimoto among them). Tetsuya Nomura, director of Kingdom Hearts 3, said in a presentation preceding yesterday’s hands-on session that the theme of this game is “resolution” — specifically, that of the ongoing battle against main series antagonist Xehanort. He also alluded to a darker overall theme than we saw in earlier titles, foreshadowed in events that take place in the mobile game Kingdom Hearts Union Cross. It’s not hard to imagine what kinds of darkness might manifest throughout the course of Kingdom Hearts 3’s story, but my time with the game yesterday was mostly a delightful, enthralling affair. The first world I dove into was Olympus, based on 1997’s animated Hercules film. The scale of this encounter went far beyond the heights of the Kingdom Hearts I remember, beginning with Sora running straight up a vertical cliff face, dodging and bounding across boulders a gargantuan Rock Titan flung downward at me. Once I reached the behemoth, I attacked its legs to stagger it before dashing up its body to land a series of direct hits on its head, culminating in an ultimate attack by way of one of the game’s many “Attractions,” impressive attacks based on rides you might find at your favorite theme park (or my favorite one, at least). 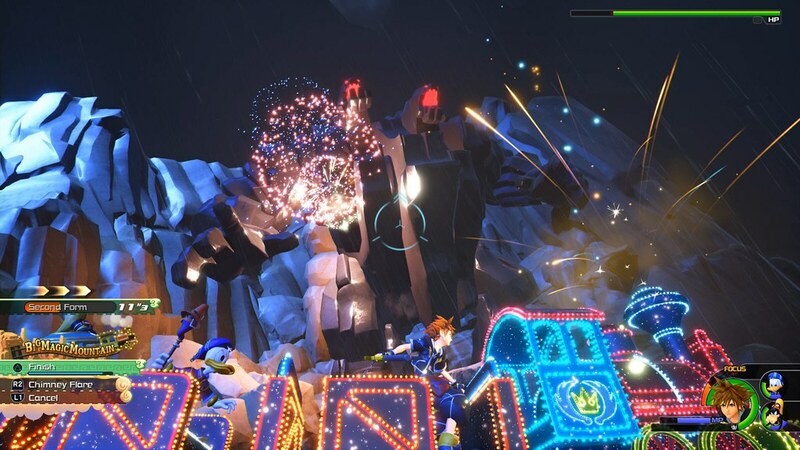 This Attraction was called “Big Magic Mountain” and it saw Sora and pals careen around the towering Titan aboard a glittering, magical Big Thunder Mountain Railroad-esque train before culminating in a final, incredibly flashy finishing move. Big Magic Mountain wasn’t the only Attraction on display in the demo. I saw Mad Tea Cups, a swinging pirate ship… even one seemingly based on Buzz Lightyear’s Astro Blasters. And they’re all decked out with a beautiful, sparkling Main Street Electrical Parade motif. Moment-to-moment combat will be instantly familiar to longtime series fans, with up and down on the D-pad selecting menu items and X executing them. Holding L1 pulls up a quick shortcut menu, handy for flinging quick magic spells without having to drill into the menu first. 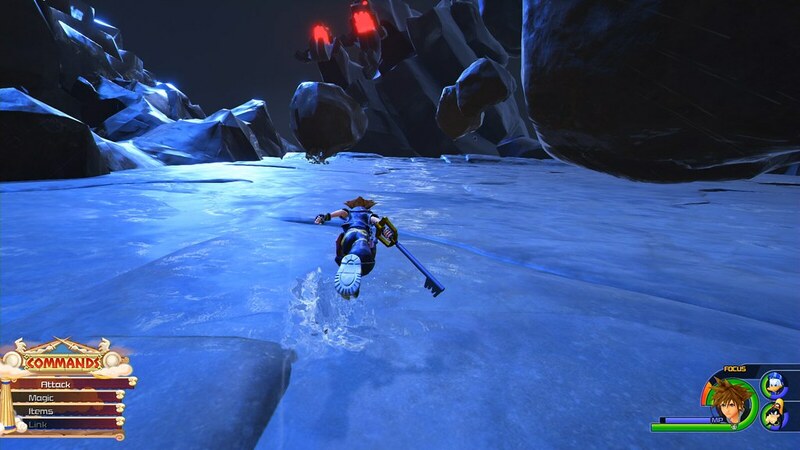 In a new addition for KH3, pressing left and right on the D-pad switches between different Keyblades on the fly, each with their own combos and special attacks. 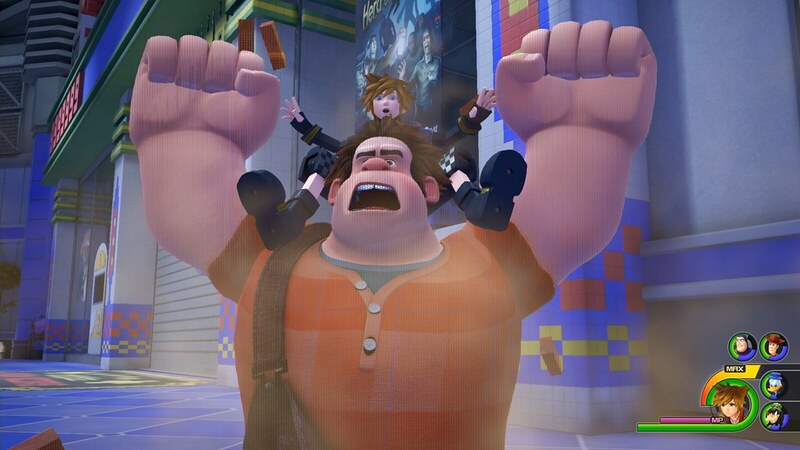 It wouldn’t be Kingdom Hearts without Disney’s most famous characters fighting at your side, and KH3 continues this proud tradition with a selection of extravagant team-up attacks starring famous faces like The Little Mermaid’s Ariel and relative newcomer Wreck-It Ralph — straight out of a Fix-It Felix Jr. machine. 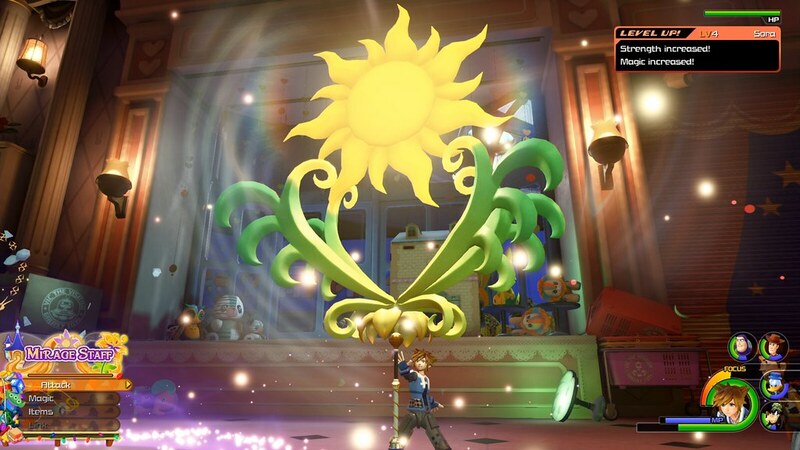 The team wanted to empower players to have more control over these team-up attacks: when Ariel jumps into the sky, for example, she creates puddles around the playfield, and at the end of the attack water fountains spout out of them, so players can create their own in-game water show. The second world I visited was Toy Story, the first Pixar world to ever make an appearance in Kingdom Hearts. This one really put things in perspective: Toy Story was, for a long time, a high bar — the holy grail of visual fidelity for video game tech. 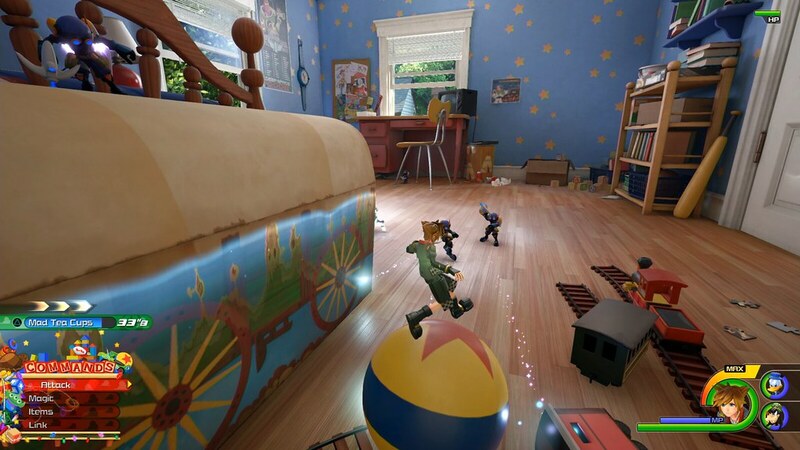 While in many ways games are now, and have been for some time, more visually advanced than the 1995 Pixar classic, nothing really hammers home how far we’ve come than playing a game that looks exactly like / literally is Toy Story, right down to the stitching in Woody’s jeans or the nicks and dings in Buzz’s plastic. My goodness. After an adorable introduction between Sora and Woody’s respective crews, the gang makes their way to Galaxy Toys in search of missing friends. 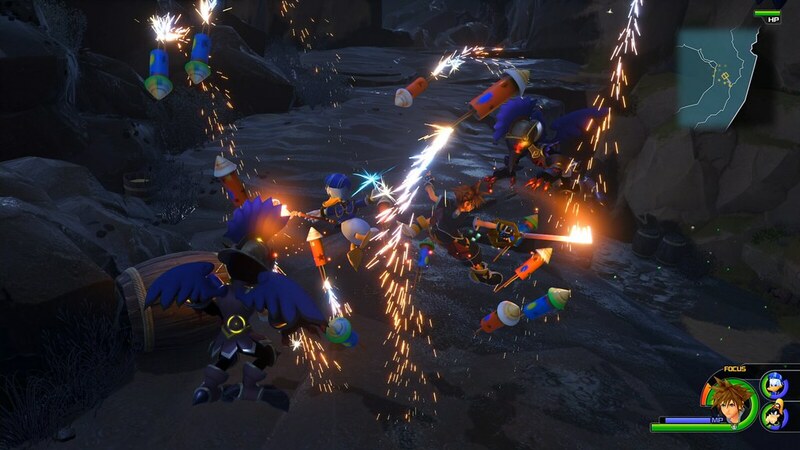 Before long, Sora is piloting toy mechas to take on swaths of well-equipped enemies, hopping into the cockpits of fallen foes to take advantage of their different abilities. It’s adorable watching Woody try to make sense of the reality-bending events that transpire in Kingdom Hearts. Poor fella’s just… so far out of his element, but his optimism never falters. Video game-obsessed Rex talking about being stuck at the Bahamut boss in a game he’s working on was a fun touch. While we’re at it, here are a few other points of interest revealed during the presentation that preceded our hands-on experience. Yosemite national park influenced the atmosphere of the Hercules world after co-director Tai Yasue visited there. Wreck-it Ralph was the character they wanted to reveal next month, but then they ended up putting him in this demo. Rapunzel’s hair was a challenge to work into the game — she holds it in a bundle with it trailing behind her, interacting with the terrain as she walks around. We saw a fun clip of her using it like a grappling hook to swing around a tree during combat. Kingdom Hearts 3 doesn’t have a locked-in release date just yet, but Nomura-san revealed during the event that they’ll be sharing more information on that front early next month. Until then, I’m going to go find some old videos of the Main Street Electrical Parade. I am excited to see Kingdom Hearts III finally getting some new information. It’s been too long and I hope they finish the game soon so we can enjoy it. Also, it would be nice if we got a ‘Warriors’ game based on the Final Fantasy franchise as well. I agree with all except the FFXIII series. We can do without them. But imagine FFVI with today’s graphics?! I would pay full price for that!!!! I don’t necessarily mean like full blown remake. I’m just talking about a remaster. So for like the classic Final Fantasy games, they can use the GBA or DS version as the basis since those have the original style graphics but update it to look smoother, update the cut scenes to look smoother and have better frame rate, etc. There’s no need to fully remake the games as that would take too long and would require too much money. The games as they are, are good enough. I like to keep games in their original form as often as possible with some slight modernizations like graphical filters and things like that. Yes! THANK YOU for mentioning a Square Enix Warriors game! I have mentioned this as well when chatting with friends online. Looks phenomenal! Picking this up for sure! Great write up Justin! I can’t believe you actually got to play Kingdom Hearts 3!! I’m so jealous! I hope it’s playable at E3, but SE usually has these types of high profile games behind closed doors for press only. Was your demo in English or still in the original Japanese? Did you play on a ps4 pro? and if so how was the performance? I can’t wait! I hope their is a sale for 1.5+2.5 and 2.8 on the PSN store soon so I can relive all of the games before release. Is there going to be an Incredibles world? No idea, Square Enix wouldn’t tell me anything about any other new worlds. Star Ocean the second story on ps4 please!